The change feels like a really big thing this year. Behind - publication, fifth kid off to university, writing, Russ at Arvon on a sublime songwriting course, two cats dying, meeting new writers, cancer... Oh yes. I have hardly written a word since. So today I start again, finishing up a project (book 3) that I had really expected to finish months ago, and onwards and upwards with the ghost story. I'm having to go back to 'hobby writing' mode - fitting it around Russell's recovery somewhat. More importantly, it will clear the decks to write book 4 - a return to my archaeologist heroine, Sage, and a messing with the myths of Dartmoor. So expect me to blog with word counts and a renewed focus on the writing. I realise I haven't blogged here for three weeks - I normally update my blog at least twice a week - and I need to be putting more stuff on my website too. The publishing industry seems far away, which will help me write. If you are struggling with a project right now, finding it hard to focus, all I can suggest is what works for me. A static word count that I have to do, even if I suddenly remember I haven't done it at bedtime. Five hundred words minimum a day - aiming for a thousand. I have 30-35k words still to write on the historical strand so here I go. Day 0 - 924 words on setting out on a trip into one of the most colourful and vibrant and disputed parts of the world in 1586 - the eastern Mediterranean. Kelley and Dee are planning the journey from Prague to Venice - then off to Candia, Venetian Crete. I've been reading a bit more, partly because I'm stalled on the writing. I stumbled across a delightful little book called The Brief History of the Dead by Kevin Brockmeier, and honestly, it cheered me up. I know it sounds a bit morbid, especially when you know I have a husband who's recovering from surgery for cancer, but it was rich, and funny and even - uplifting. It's about the end of human kind and more, the end of heaven as they know it. Uplifting? Funny? 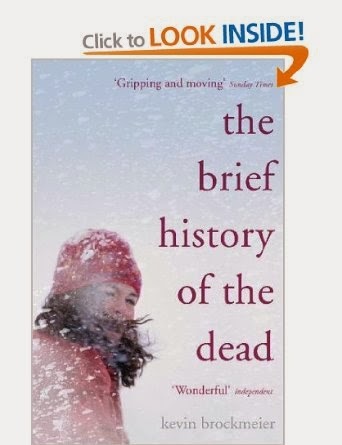 Brockmeier tells two stories, one of a researcher (Laura) cut off in Antarctica and therefore safe from the pandemic killing off all the people and another narrative, of a sort of pre-heaven. People die, and then they go to this parallel world where they remain until everyone who remembers them has died. Then they move on... The problem is, everyone is dying, so the pre-heaven world starts to shrink to all the people that have at one time, touched this one woman's life. The characters are so richly drawn, and the drama of Laura's struggles for life so compelling, it was hard to put down even to check an oozing dressing or watch Russell inject himself with heparin (how exciting our lives have become). I can recommend this little book wholeheartedly, even if it does predict the end of the natural world and mankind. Meanwhile, I can't write because my brain is busy trying to organise Christmas, manage foods (not easy with two special diets to consider) parent children and look after an invalid. The hospital sent him home less than 24 hours after a 4 hour surgery, so he was very fragile at first. One of my cats is expiring on the chair in the kitchen... life has been a bit tricky. I'm looking forward to getting my brain back. Things are changing fast here at Alexander Towers (my house is NOT called Alexander Towers but it so should be!). Cancerman will be cancer-free or close to it within the week (is it tasteless to call him Cancerman? I do think of him as a superhero), two people have recognised me *cringe* from a newspaper article in the Daily Mail, and both were really lovely about it, I got notes about book 2 from my editor, which were very helpful and positive, and I've been trying to organise the whole of Solstice/Christmas before the surgery. We've also fitted in a wedding, trips to the hospital and mastering eating out when one of us is gluten-free and one is vegan. We are also going for a cure for his cancer, and have a great team behind us. Meanwhile I have barely written anything in two months, usually the time it takes to write half a book. It's depressing, and I've realised how much therapy writing is for me. Losing myself in someone else's much more immediate worries (if fictional) and if necessary playing god at the same time, is therapeutic. I always knew that but now I'm finding it works better than I thought. So I'm going to roll my sleeves up and write again, get back into my routine, because I feel like I'm blown about by hospital and kids and Christmas and not by the demands of the books. Not to mention cooking vegan every day - that's an hour extra most days, because the kids aren't vegan and there's a lot to do! * It's OK to call him Cancerman providing I stop once he has the surgery. He's still going to be a superhero but with better health. I'll try really hard not to point out how much he glows in the dark during radiotherapy. Really hard. That's me, with the hands trying to reach the air. I may be waving. I'm waiting for cancer to be scooped out of the man I love so he has a chance of living. A good chance, sure, but surgery is so savage. It's so aggressive. But so is the cancer, so we have to man up and cope with the whole thing and not let it affect our lives too much. Only it does. It's hard to think about anything without it creeping in. I'm writing the end of book 3, in which a couple of characters die, and it's heart-breaking. I want to save them, I want to wave my god-like writer's hand and rescue them because I can't do it in real life. In real life some young woman surgeon gets to wave her less than god-like hand and attempt to get all the cancer cells that have inexplicably set up home inside an otherwise healthy man. No, we have to rely on human skill and radiotherapy and drugs. So my writing and my life are melancholy at the moment, and I'm trying not to plan too much, or commit to anything beyond the needs of my large family and the books. I'm waiting to rewrite book 2 and knock it into shape for my editor, then finish book 3, late but better (hopefully) than the others. Meanwhile we grieve for the old days, when we planned a long future and enjoyed our ignorance. 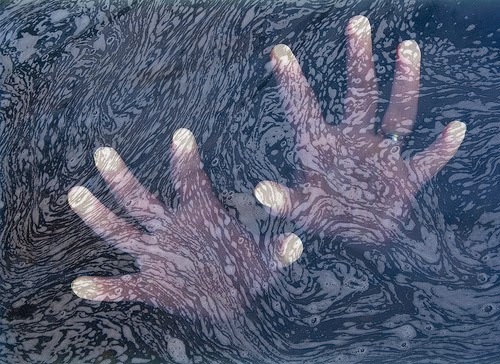 I think I may be drowning after all. It's been incredibly difficult to blog through the last few weeks. I thought it would be easier, with the book coming out on the 10th October, but that fact has been overshadowed by other events on my life. Twenty-two years ago, I was widowed. My young husband was being treated for a chest infection in hospital when he collapsed and died from what turned out to be leukaemia. I was crushed, and also felt totally let down by the medical system that had repeatedly failed to notice - despite us asking - that he had leukaemia. Now, in the last few weeks, my second husband has been diagnosed with another form of cancer. I don't want to dwell on it here, but you can't totally put yourself aside when you write (well, I can't, anyway). At least he has been diagnosed, and has been offered treatment, and unlike Steve, has a good chance of surviving, at least for many years. That's all I can say about it, except that it has driven a tractor through my writing schedule, and with surgery coming up in just weeks or days, will continue to do so. I shall just have to write when I can. 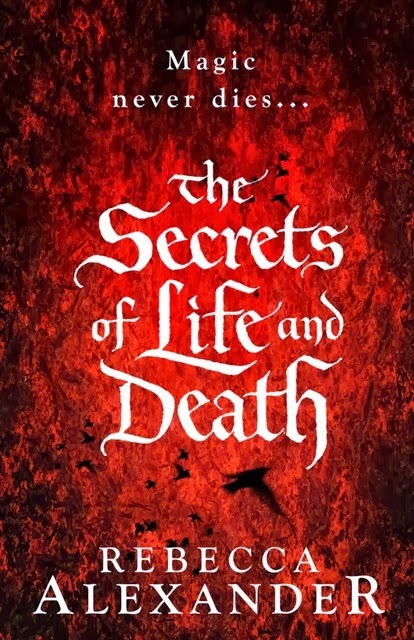 Book wise, the good news is that The Secrets of Life and Death has sold in Finland as well as Germany and the US. I have no idea how it's selling here yet - hardbacks don't sell well here and it's really Kindle sales and Amazon that we'll eventually look at. The paperback will get a bit more of a plug next year. Selling abroad is just a bit of a bonus for the author. They may be quite modest sums involved - the cost of translation is huge - but the writer doesn't have to do anything for it. 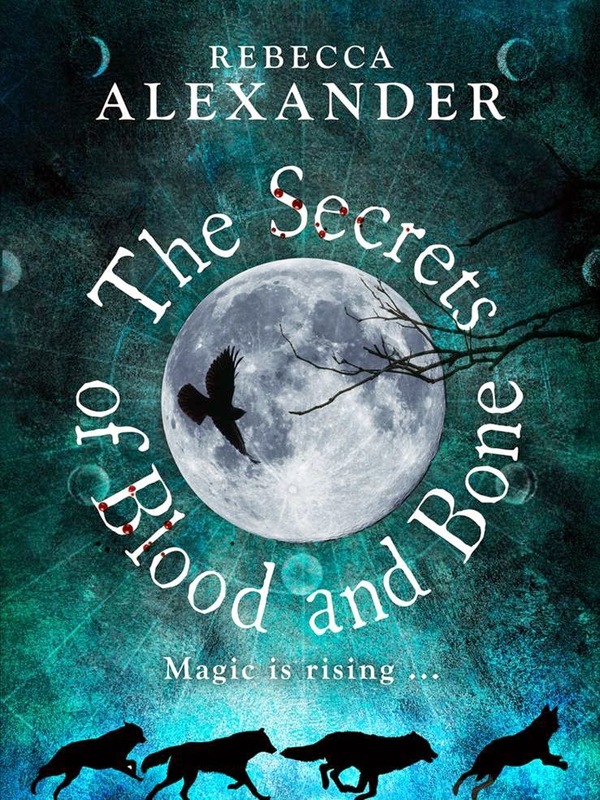 I'm really looking forward to the covers - they will suggest another take on the book, another graphic interpretation. Interesting stuff. I'm tackling the contemporary strand of book 3 and after sorting out a weird moment when I've introduced two different divergent explanations of the same thing, have found the story flowing again. I'm looking forward to adding all the Kelley stuff, of which I've written about half, but will need to completely rewrite in the first person having started out in third. The thing is, the other two books work in first person so I think I need to bring them into line. Tricky stuff when the tale is being narrated as much by his daughter as anyone. I'll work it out. I have had great fun blogging for Mslexia - another distraction from blogging here. I also had the surreal experience of being photographed for the Daily Mail. This led to some strange conversations with a make-up lady called Antonia. Everything I have is black or patterned. Or black and patterned. I usually wear an apron, since I'm always the cook, or we're going to someone's barbeque in which case I wear T-shirt and jeans. Like I'm wearing now. I wouldn't let her put curlers in my hair, but she did plaster me in make-up - to my mind, anyway. I do appreciate that the flash will bleach out anyone, but I don't normally wear make-up since I don't really give a f*@k what I look like. I couldn't wait to get it off. But she, and the photographer were so nice and friendly and kind we did do our best to co-operate, and hopefully the result will be worth it. Watch this space. Beyond publication - what happens next? I must believe that anything I do to the empty page must be worse than just enjoying it's white lovely blankness. So I said (with three adjectives) in 2009. Since then I've written about how much courses have improved my writing, and how much reading improves my storytelling, and I've banged on about how competitions can get you a) noticed and b) an agent. But now I'm in the And Beyond area - what happens after your book comes out? Foreign deals were one thing I hadn't expected. First it sold in dollars to the US, nice to know but since I'd sold the World English rights, it only affects my advance here (it pays some off). I might have to look at some edits to make it into an American book at some point. But then it sold in Germany - wow! I get a bonus, and the best thing is someone else gets to do all the work of translating the novel (they get handsomely paid, don't imagine some language sweatshop turning out manuscripts in various languages). So I went off to the World Fantasy Con (my first) and immersed myself in the world of fantasy writers, editors, readers and agents (this is my impromptu interview with audible.co.uk). I got home to find there had been an offer from Finland as well, so exciting! Life also goes on and I'm adapting to some changes in our family up here on our clifftop, haunted and rambly house (more adjectives). It looks like we may be better moving into town, so I'm going to have to fit edits to book 2 and finishing book 3 around packing and showing people around. *Sigh*. I shall miss it, even the ghosts with their malevolent influences, and no doubt it will end up in more books too. It's been a strange and wonderful journey, from almost too afraid to expose my first attempts to a tutor on a course, all the way to publication. Today I got flowers from Del Rey UK, although I think I should have sent them some, so beautiful is the cover and all the work they have put in to make it stand out. The others are from Russell, who has been amazingly supportive. My friend Downith hosted a blog interview on her blog and the book went up on our very own Del Rey website blog. 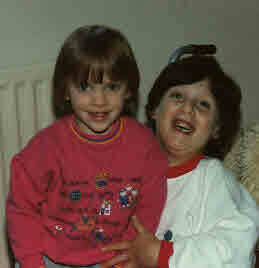 I've blogged for Mslexia today about my journey from 6 year old writer to the present day. And I received a card of congratulations from Charlotte, my agent, who is so encouraging and supportive she has filled me with renewed enthusiasm for writing. I've eaten too many chocolates, gone out for lunch, and have a bottle of something with bubbles cooling in the fridge (and I normally only drink at Christmas!). It's been a very long day already. I find myself humbled by the process, the very good fortune I have had to get published. I know there are many writers just as good, with just as good stories, who's timing hasn't been so lucky. I shall continue to bang on about these writers because, while I may be a debut writer, I am a pretty experienced reader. I would like to see these people's books out there. I have also had my very first Amazon review. It was a good one, and whatever reviews come my way, that will be the one that cheers me up this evening and gives me hope that at least a healthy percentage of readers will like the book. Whoever Alisha Bookseller is, she has put frosting on an already very good day. I've started my ghost story - or rather, I've started the complete rewrite of the ghost story I wrote three years ago. It's creepy fun, my only dilemma is the main character (ghost's) name - Charlotte. That's my agent's name, so it seems odd to keep using it but honestly? It was her name first and I'm struggling to change it. Maybe I'll be able to further down the line but for the record, Charlotte the ghost is completely unlike Charlotte the agent, who is lovely. I've also found that it's entwined with another story, the family history of the main characters from their home in the Caribbean and their reluctant return to England. I love the idea of one of those rich families in colonial times gradually losing all their money and more importantly, status, over time. I'm also interested in the experience of people of mixed ethnicity and class in the 1940s, so will be looking at some research about that. I may just have to go to the Caribbean for research purposes. Sigh. The book comes out on Thursday, and I've sent off 24 copies for review and publicity. It has to sink or swim all by itself now, I'll see what happens. I do like the physical presence of the book, it's a small hardback with a touchy, feely embossed cover, it feels a bit different when you hold it. That seems in tune with its fantasy theme. I'm looking forward to celebrating with friends on the Island this month, and then with Devon friends in November. Great excuse for a party, really. In between, I will be at World Fantasy Con in Brighton for a couple of days, please come and say Hi if you're there, I'll probably be skulking around the Del Rey UK area, hiding behind my book. Lots of things have happened in the last two weeks. Kids have been taken to university, one daughter has got dream job and now speaks in frequencies only bats can hear, and I have met loads of new writers. Well, not new but new to me... I started teaching locally a few months ago, doing a couple of short story workshops for the library in relation to a competition, then a couple more in two libraries - and it keeps my writing practice pushing forward. People have problems with adjectives - it reminds me to work on my overuse of them. People have slow starts to stories - looking at mine yielded some extremely boring first lines. People have problems calling themselves writers - well, we've all been there. Apart from that it's also been a worrying few weeks about health issues (family, not mine) and now one of the cats has swallowed a load of string. We're feeding it and hope it will pass said string (I'm not looking forward to counting up the pieces from the litter box) otherwise it's a vet visit. The book actually coming out seems far, far away - but is only on the tenth. I think it will all seem real when we get together with friends on the Island to celebrate on the 22nd. Meanwhile I have contacted my agent and she suggests writing another book for her to sell. 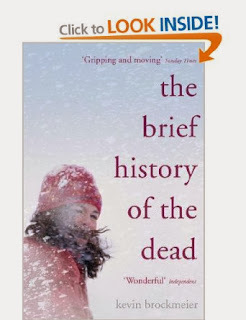 I was working on a thriller but have gone back to a book I started years ago and love. It's the story of two sisters, one of whom dies, and the other carries her around in her head. It's a ghost story but in my imagination ghosts aren't all bad. It's also about genealogy as three women come together because they share a common ancestor, the kind of man who creates lost souls trapped in the house he built. I'm having fun with it, and book three is still getting added to and tweaked. The book has arrived. In its shiny, glowing redness, and it's very lovely. It's been so long since I read it I've been picking it up and getting drawn into the story with ... ooh, I wonder what happens ... wait, you silly idiot - you know what happens! It just seems very different from the first draft I know so much better which is far less readable. This is middle daughter holding said book. That makes it seems even more real! Two things I made and I'm very proud of both. It does remind me that one is enormously more important than the other, though. The summer has been full of family challenges and it's focused attention back on what's important. Love writing books as I do, it is just what I would do anyway. Meanwhile, I am struggling to re-engage with book 3. I've just run off a copy of the chapters with Edward Kelley in to look at again, as they are weirdly clumped together in a few places in the book and absent from others. I also think I've fallen into the trap of starting slow with the historical strand, when I should have started with a bang. Book one starts with being chased by wolves, book 2 with being robbed and knocked out, book three with - sitting at the table talking to one of his children. I think I can do a bit better than that! It will be fun to travel with Edward Kelley again. I'm also thoroughly enjoying blogging for Mslexia in the run up to their women's novel writing competition. I've got a couple of friends entering, I hope they get as much out of it as I did! 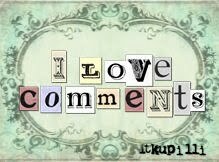 I most recently blogged about the writing community of bloggers I belong to. A generous and helpful community it is too. Which gives me a chance to mention a fellow blogger, Kate Kelly, the Scribbling SeaSerpent. 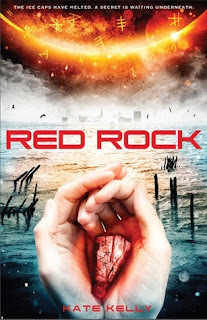 Kate has just published her first book with Curious Fox and if you are buying a book for anyone older than say, ten, Red Rock is an excellent read. It's a fast paced dystopian novel with a very human and very appealing central character, Danni. It's part of an increasingly important genre of cli-fi, as in climate change, and is scarily convincing. I couldn't put it down, and neither could my twenty-three year old son. Well worth a read, it's published in paperback at £6.99. I wrote an actual, bookshop-ready book. Really. And for those who thought I was making it up (perfectly possible, I am a fiction writer!) here is an actual book, on the desk at Random House. Really. Wow. Aren't they pretty? I just hope the words came out OK! One month exactly to go, plans to publicise said beauties, and book three coming on nicely. Excellent news all round. I can't wait to actually hold one. It's all happening. My agent moved agency to United Agents, and I'm going along with her so I don't lose all of her help and expertise. The book is coming out, kids off to university, life racing along at a dangerous speed - who knows where it will all end up? Statistics show that about one in ten published debut novelists have the golden ticket, they actually make some money for the publisher or at least don't cost them loads of money. I've got everything crossed, because with all the work the great people at Del Rey UK have done to make the book look its shiny best, I want it to do well, not least because they might want to publish a few more. Now let's see what Jack and Sadie and Edward Kelley do when they are out in the world. It's September, and although the weather is still lovely and warm, rain is on its way. I love autumn, the seasons run through my books. The Secrets of Life and Death is set in late autumn, in the leaf-fall and frosty morning time, running up to Christmas. The rain pelting down, the crisp frost on the grass around the cottage, even the damp chill of the priest hole under the house all adds atmosphere and indirectly to the story. My main character is at the late autumn stage of her life, not through age but through her unique situation. The magic is running down like an old battery, and the year with it. A Baby's Bones is set in March, the spring sunshine slowly warming the landscape, and the story is about three unborn babies, one at least of which won't make it. All four of my own babies were due in the same month - 4 May to 4 June. For me the spring was all about growing babies. The spring comes early to the Island too, where the book is set (that's the Isle of Wight, where I had to invent a village called Banstock). The sequel to The Secrets of Life and Death, still known as Book 2 in the family, is also set in the spring. There's something about the changeable weather that makes it satisfying, and also it's cold enough to be painful if you're lost in it. But autumn is full of my favourite moments - making jams and chutneys, sending kids off to university rested and ready to learn, watching the garden orb spider growing fat on late flies, picking blackberries and plums, planning the return of all the kids for our solstice celebrations. It's also a time for a good clear up to put our winter rugs down and sort out the greenhouse and plants in the garden. We have badgers visiting the front of the house each night, they will start fattening up for the winter soon. (My most friendly badger has already achieved winter weight, and possibly next winter's as well - I'm starting to feed her chopped apple and low calorie dog foods.) The wild birds are finishing their moult and starting to return to the feeders with trim feathers, even the chickens have shed a few. There's a fresh feeling in the air and I love it. The book coming out in the middle of it all is a great bonus. There's also a great giveaway on Goodreads - check out the details in the sidebar. Good luck! Five weeks to go before publication. This was taken on a brilliant afternoon when I got to hang with the coolest of birds, Brann the raven. I am still occasionally saying 'Wow!' at the sheer wonder of it. Yes, he really is that big. He's also the gentlest of creature, flies like an airborne ninja and loves his work. Even when he has to pose with authors. It was an amazing day, and I was blown away by the wonderful life the handlers, Lloyd and Rose Buck, give these birds. Brann loves working because he gets to hang out with Lloyd. Check out their website. We met all sorts of birds, including stunt starlings (there's a sequence with Chris Packham) and a golden eagle that started Russell saying 'Wow' too. My only regret is not spending time with their crow, but he was chilling, still in his moult, so we didn't disturb him. That beak can crack a walnut. Other times I feel like I'm just plodding away writing, looking after kids and animals, and life is much as it was a year before when I didn't have a deal yet. Other writers have warned me, it's a quiet time and it's normal. I feel I should have T-shirts printed or something. 'Ask me about my book' or something. Although, I still can't pitch it, so it would lead to a lot of odd conversations. This is my fault, not the book's! We're worrying about money along with everyone else because I haven't seen any money for many months and we have extra kids home. So, we are thinking about selling our house. Now, this makes me heartsick, because I love living here. It's old and creaky and none of the floors are level but it has hot and cold running woodpeckers and badgers, everyone has their own room - and it's high above the valley facing south. But we moved here with five kids and all their stuff and we'll be down to two in the autumn as two boys go off to university. Maybe that's where the sadness is coming from. One lovely distraction is the camaraderie I'm getting from the writing groups in Barnstaple, and other writers I've met. I'm also teaching, always a joy, and that is as grounding as it gets. Here are these people writing some great stuff, and the only difference between me and some of them is probably the amount I've written and a modicum of luck. I think a couple of them will catch me up. It's a great community to be part of. Today I was told the book is coming out as an audiobook. They even sent me samples of four actors they were considering - two men to read the Kelley strand and two women to read the historical strand. I had a clear favourite so I let them know my preference, I think we're all in agreement! There's this machine that is taking my book and turning it into products - the type I like, stories. Great stuff. It's forty-two days today until publication. Who doesn't love the number 42? Tomorrow we go off to take some pictures of a raven, a real live raven who, with his handler, will be helping us create some more publicity pictures. The raven's name is Brann, and he is beautiful. They have a sixteen year old crow, too, but I don't know if I'll get to meet him. This a video of him and a peregrine falcon flying to their handler - on a moving truck, filmed in slow motion. The raven flying upside down is awesome. So it's all pootling on, I'm celebrating on the Island with my friends and family on the 22nd October, and the book will be away, hopefully making new friends. Who knows. If not, I had a great time and I still have two books to go. I am very, very lucky. OK, I'm back. Two weeks off and ready to run again. I've managed to work on the ending a bit more, I have about 16k words of what will be the big final battle. It will round off plot threads from all three books (hopefully) while leaving the way open for book 4 and 5. I'm over halfway with the book, but as usual, I have a strong beginning, a new ending and little idea about the middle. Each book seems to have less middle, and more beginning and end. Eventually I'll just write the two ends and join them up. I've been networking, and have met a talented local writer who is a long way down the journey to publication. In fact, I've met several strong writers recently and am hopeful that I may be able to put a group together than will help me keep learning and push forward. Opportunities for learning have become more difficult to find. Part of me would love to do A215 again, this time with more attention. I'm still writing and reading, of course, but it's nice to have someone look at your words and point out what they've noticed. I'm in a bit of a dilemma with the books. 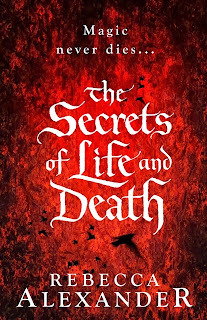 Last year, when I didn't know if I would get a book deal, I wrote A Baby's Bones, a bit of a prequel to The Secrets of Life and Death. My agent, Charlotte, threw that in the mix in case they doubted I could do other books. The problem for me is, they bought book 1, book 2 and the prequel. I have since realised that I would much rather publish the whole trilogy with Del Rey UK. I love being in the same stable as Django Wexler, EJ Swift, Liesel Schwarz, Kameron Hurley and Mark Hodder. Big names! I often wonder if being prone to depression has invaluable payoffs for a writer, musician or artist. I know people who are bubbly optimists, and who minimise emotional pain obsessively. They are the ones, when someone dies, who tell you 'he had a good innings' or 'at least she didn't suffer'. But when something does go wrong they don't adjust as well to illness or change. This is no help at all when I'm actually gloomily wading in the muddy swamp of grief I find myself in every August but when I come to write...it does kind of help. One of my characters grew up isolated and sick. her life has been defined by her struggle just to live, it has affected her personality. When she rises above that, fighting for her family and who knows, even love, she is sort of heroic. That's the way I would like to see fighting out of depression, heroic. But people who have never been depressed really don't understand it. I've heard all the 'why don't you go for a walk' and 'just ignore it and do something nice' comments I can presently cope with. Depression affects the way you interpret the world. It's like saying to someone who's temporarily blind, 'why don't you go and see some art? That will make your eyes work again.' Hm. No. Depression makes it exhausting just doing the things you have to do, let alone stretching yourself to do more. It's like having the flu. You're exhausted, you ache, you feel weak. And you are sad, painfully sad. It's easier to do nothing because whatever you do do hurts. But, if I can drag myself to the computer, something else happens. I write less, that's true, and my concentration is pants so I can't organise my thoughts as well. But the writing is richer, more emotional, more true somehow, as if it comes from a deeper place. I suspect it's less guarded or filtered, and it certainly uses all the colours in the emotional paint box. My character is fighting for her self, as she feels she's losing the battle. But she keeps going and it's easier for me to understand her feelings. For me, this is grief. Years ago I spent ten exhausting days watching my child die, and those days have left a mark. Every year I relive the agony of not pushing food and drink on an eight year old who's decided not to eat and drink. Watching her pain escalate and her morphine with it, until she slept through the last day. Feelings ran up and down the emotional scale from the very top to the depths, every day, all day for those last ten. I seem to run that emotional memory through the background of my life these years, and it's exhausting. Where I didn't sleep in the past, now I have insomnia or nightmares. Where I was anxious then, I get sudden panic attacks. I know it will be over on the 22nd August, the day after her death, but in the meantime, I'm trying to keep writing, and keep remembering until it's over. It will be over soon. I've started counting, like a kid counting down to Christmas. 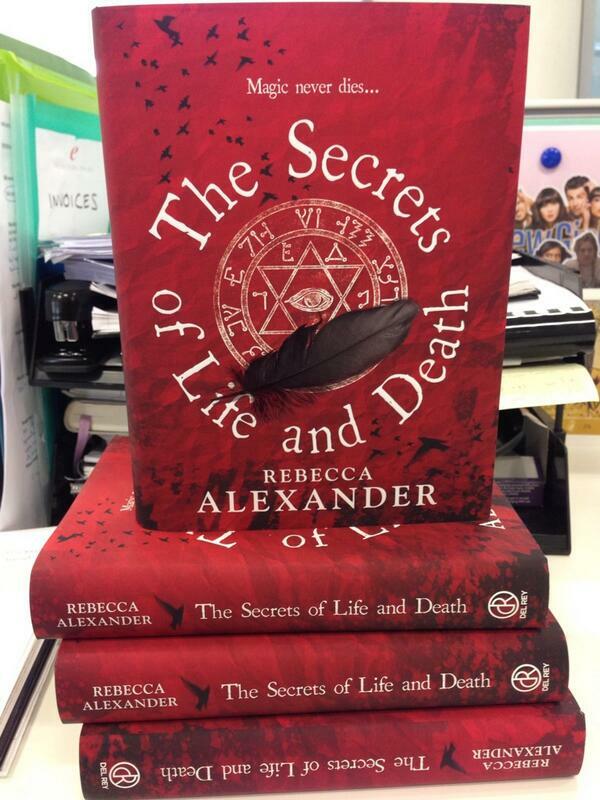 Even though I've been warned - publication day might be the quietest day in the calendar. So I'm planning something small, maybe a meal out with the kids or something. I feel like I ought to celebrate somehow! Meanwhile, I've hit the argghh moment with book 3. It happens later and later, but basically I run out of plotting to write. Everyone's in a bit of a tangle, basically, and I can't think how to get them out of it. My strategy (which might be rubbish) is to start on the ending. It's what I've done on the previous books, and at some point I expect to realise there's a really big beginning and a big ending - and I can just join them up. Hopefully. I wish I had a bit more control over the process. I've been meeting other writers as well. It's interesting. Even when you meet people who are just taking up writing again, or even for the first time, you learn something. Most writers are very experienced readers, and they just have an eye and ear for weak spots in a story, clunky prose etc. But there are some rather good writers in the mix, some pushing forward towards publication, as well as a more experienced published novelist than me. It's nice to be in a group of writers again, worrying about the use of a word or fussing over the pace of a scene. Meanwhile, as it does every year, my inner skies turn grey and nightmares sneak in. My daughter's death haunts me every year for ten days - the same ten days we nursed her at home through what we realised was her final illness. I don't know why, but the nightmares are often about corpses, often floating or on ships. I have no idea, but last night's one was particularly bad. I ended up sleeping a few hours with the light on. Is it any wonder I tend to gravitate towards horror and crime? Writing one book - or a series? It's true that publishers like series. If readers invest in characters, they like to know more. I wonder if it's easier to get a book deal with a potential series than a collection of one-off books with unique characters. I was in a writing group the other day listening to a rather good historical writer read out an extract from a book he was writing. He had been unable to form all his ideas into his first novel, and had already planned two sequels. This wasn't cynical, he isn't yet looking at publishers, but for him the appeal of a series of books about well developed characters was as much the writer's as the reader's. It occurred to me that it's so easy to write a book when you already know the people, the relationships, and have had time to consider the longer story arcs. But. In writing the first book, you set some things in stone, and it's difficult to go back and change them. I also find it hard to keep tabs on everyone and all the back story. I should keep records, obviously, but I don't because I always think I'll remember it. Now, writing book 2 and 3 and planning books 4 and 5...I'm running into continuity errors. Big ones. The only thing that's helping is having to edit the older books while I'm writing the new books, that has saved me from a few serious slip ups. There's a lot of going backwards and forwards, checking, checking. A friend of mine is just hoping to sell her book, but looking at creating a series possibility to make it more saleable. That's probably good advice for anyone wanting to sell a book in this market. At least if they make good sales the publishers will encourage more in the same vein, so it helps to have outlines planned even if just in your head. Even if you never write them. But, who knows? You might fall in love with your characters and want to take them on more adventures. Oh, and in case you missed it, I'm blogging for Mslexia at the moment! You could have written (and maybe you have!) a really great book. But if no-one knows about it, how will they buy it? Talking yesterday to the publicity and marketing departments, and was completely reassured. People will be told about my book. They will be offered opportunities to read it, or write reviews. They were helpful, encouraging and had ideas. For example, some authors put up readings, extracts or interviews on youtube, which reaches a different audience from, say, someone who reads the broadsheet reviews (of which there are few). It also made me realise the networks of people I am part of are more than I appreciated. I need to master all this networking stuff. I also need to master twitter. Not easy... I am just worried it will take up more time I don't have. It would be easier if I had one of those all singing/all dancing phones that do twitter and FB and emails. Mine only begrudgingly does texts. So I'm reading Tweet Right by Nicola Morgan and making copious notes. My ambition is to find my way to putting up a picture on Twitter, maybe even this blog post. I wonder if it will work? I have managed to tweet before but have never been sure quite how I did it. I think my address on Twitter is @RebAlexander1 and hopefully I have tweeted a picture of our neighbourhood badger. Possibly. Possibly not. Meanwhile book 3 races on, and I'm loving writing what I think is the best of the trilogy (possibly because it's the one I'm working on). The book now has a US publisher, a paperback house that will put it out next year. It's weird that it has a life of its own, I'm just in its past! Well, maybe not if it needs translating for an American audience but I hope not too much. Like most writers, the only project that I understand at the moment is the one I'm writing NOW, and the past books, even book 2 which I only finished in May, are in the past. I'm waiting for notes and edits to do on book 2 - but probably not for a few more weeks. The only frustration is, until I get it ready to deliver I don't get paid and having most of the kids home is turning out to be expensive! I have itchy feet at the moment, looking at other places to live. I always said I would do the big, inconvenient house to contain the then five kids for five years, but it's been six years and no real prospect of moving until next year. I think I need a house where I could just walk out the front door without abseiling down the drive and walking a mile over the switchback road to town for a paper. The landscape here isn't so much steep as concertina'd. One thing that I enjoyed enormously last Saturday is the first teaching I've done for a while, and the first teaching of adults for ages. We looked at short stories, finding the starting points, and developing them. It was brilliant, as usual it made me really look at my own writing, reminding myself of the basics (again) but also at the delicacy of touch that some people have for short stories, for me, the hardest and purest form of fiction. I'm passionate about teaching, and there is a huge gap in my area for creative writing tuition at degree or MA level. I'm hoping, with others, to fill that space and develop a culture of good creative writing - and improving writing - in North Devon. Yesterday, I spent the day with Frances Corky Thompson and a small group of selected poets. We were looking at all aspects of travel and writing poetry and feeding back on it all day. The workshop was run by Ruth O'Callaghan, whose new book The Silence Unheard is available from Shoestring Press. What a switchback ride. Ruth moved us straight into creative mode, jotting down impressions from a photograph, feeding back on the results, then getting us to start forming our impressions into a poem. The whole day was like that: work, work, work, think and feedback around the table. The six participants worked so hard, produced some amazing work, a couple of formed poems that blew me away included and loads of drafts with gems embedded in them. (I came away with dozens of lovely words highlighted). It was an advanced workshop, I was trawling through my knowledge of metre and rhyme, alliterations and onomatopoeia, weaving more and more references in. There were a few moments when I was just baffled, the word penumbra, for example was one I had heard but never understood (it means part shade, apparently). I'm probably not one of those people who will have tee-shirts printed, jump up and down saying 'read my book - it's brilliant!' or bully people into buying it, but I accept that sales will be restricted to friends and family if I don't get out there and work it a bit. Because, it is a good book and it's written well and it tells the story of characters I love and believe in. So I'm networking. I'm teaching, which reaches a few people (and I love, and it pushes me as a writer!). I'm hoping to do an author event in Barnstaple, which is good. I'm meeting people who are happy to promote a local author. I'm reaching back to my other community on the Island, which is still where my heart wants to be sometimes. I'm spending time on the computer connecting with people. It takes masses of time. It takes more time than I ever expected. I have a writing website for teaching. I have just purchased website address for the books which will need servicing and looking after. I still have blogs etc. I'm webmistress of the North Devon Publishing Project (look us up) and I'm still trying to be a wife, mother and occasional reader. And fit in book 3 and research for book 4. Hm. Something has to give. So, I'm hoping to meet up with the lady who will be doing publicity and maybe the marketing lady too, if she's around, and ask them all the baby questions that I need to understand to further promote the book, and hopefully reduce the anxiety and even manage the work better. How does one market their book? I feel like I need to invest in this first one. On my MA we were visited by an editor who said 'you only get one chance to be a debut author', and I know he's right. Making a splash for book 1 will give further books more of a chance. Despite all this, I'm back on track with book 3, despite the distraction of sunshine, beach days and prickly heat nights (ouch!) and will be off celebrating my birthday with friends Thursday and Friday. Fabulous times. One of the things I find less appealing about the English is that they seem to moan excessively about the weather. I LOVE our weather, we have one of the most fertile and varied climates in the world with some of the most fertile environments. Apart from a few adder bites every year we are largely free of man-eating creatures, our stinging nettles really don't compare to some of the poisonous plants around the world. And we manage bright sunshine and snow - sometimes just three months apart (remember April?). I'm loving it, even though I have developed prickly heat. Whether you like the sunshine or not, chances are some fog/rain/gales will be along shortly. At least we're topping up our vitamin D and our melatonin levels. I think I got seasonal affective disorder last summer in all the dark days. The weather somehow creeps into my books. Secrets 1 starts in the autumn, leaves falling, the first frosts, driving rain. The story works its way up to the winter solstice (or Christmas). Secrets 2 is set in the following spring, the icy winds giving way to the first sunshine and the springing of bulbs. It also features a garden finding its way back to full fertility, buzzing with the first insects and new growth. I'm doing a couple of workshops before I launch myself into the unknown world of book promotion (I'm hoping to go and see the relevant people in the next few weeks!) and it's getting my creative juices flowing. I love going back to the creative writing books and my library of fabulous, inspiring authors. 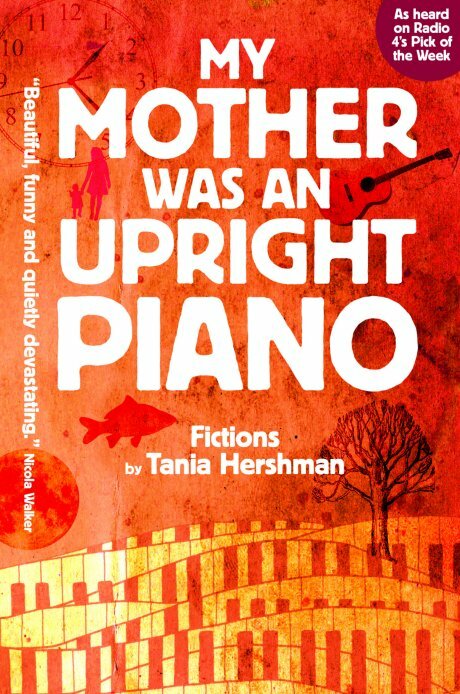 One that blew me away from the off, was My Mother was an Upright Piano by Tania Hershman. She reads it here, and it remains one of those little gems that gets me reading it, smiling at the clever, funny imagery but left somehow profoundly sad. Teaching makes me think more creatively about what I do myself, whatever I'm teaching whether it's counselling skills or psychology or statistics or whatever. Maybe people think I'm odd when I say it, but I really do learn as much by teaching as I do by sitting in a class. 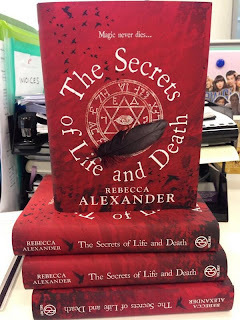 I've sorted out a website for teaching called www.rebecca-alexander.co.uk and I've bought up "www.thesecretsoflifeanddeath.co.uk" for a website related to the book itself. I hardly have time to write but it's all making me focus. On the book 3 front, I've found the fatal plot flaw and ironed it out neatly, so I can go back to writing and develop a few more. It's my method; it's not pretty or efficient but it's mine. It's been a long week of exploration of research for future books, and an internal debate about how much I can actually do. In a good spell with few or no interruptions, I can enjoy writing about 2 books a year, or just under. I can also manage some poetry, some drama and a bit of short story writing (even though I find it the most time consuming). With family problems, distractions and real life, it starts to dwindle down to just the books. At the moment, book 3 is growing nicely, I reached a point where I knew it was derailed but had found a way to rewrite so I paced it better, which is always my bugbear. So I'm back writing, while book 4 buzzes in the back of my head from all the research and the pictures and sensory impressions we gathered from Dartmoor. I started by writing the snippets of 'Dartmoor lore' that will shape the contemporary story. It will be a bit of relief to get away from the sixteenth century for a book and instead play around with the Victorian era. It will also be nice to write a bit more about my other character, Sage, the archaeologist from the prequel. I like her, not least because she has a solid scepticism about all things that go bump in the night. 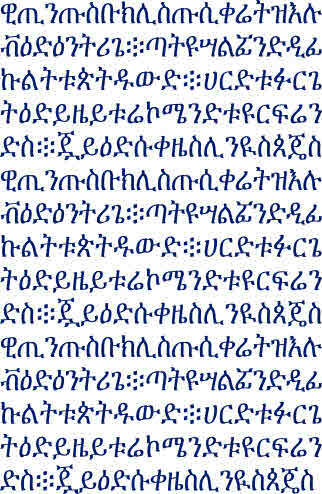 The script above is called Ge'ez, it's one of the very earliest scripts ever written, some of the very early books of the Bible have been written in it. 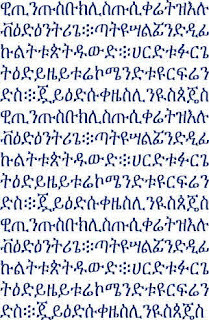 Associated with the earliest Christian community in Ethiopia (strange to think the earliest church wasn't in Rome, but in Africa!) the script remains as a written language that is only used in the church, a bit like our Latin. 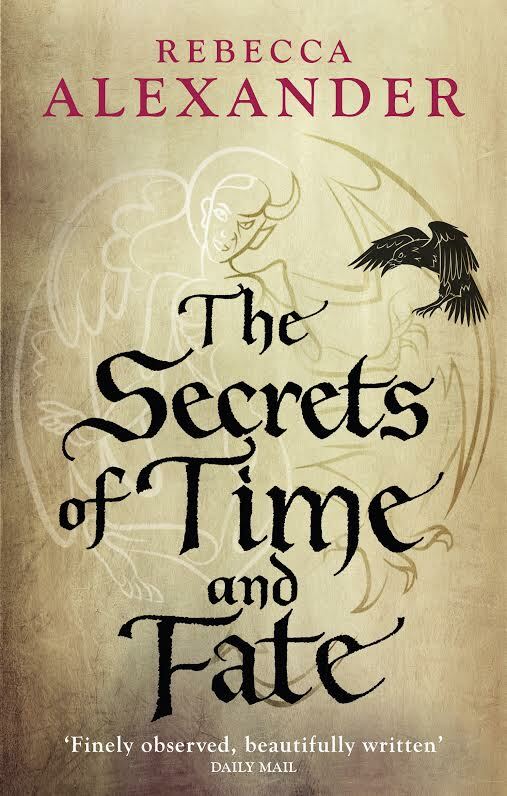 It spells out a message to enjoy the story, it amused me to think that 'magic words' might play a part in the promotion of the book. The book of Enoch, not canonical in most Christian or Jewish texts now, was written in Ge'ez in the third century BC. Sometimes these little snippets of fact find their way into my plots...it describes all the angelic beings. Playing around with angels is almost like inventing aliens, you have a lot of room for manoeuvre. Always a bit reclusive (isn't that an occupational hazard of writing?) I've been making a real effort to network and it's paying off. I've met some interesting writers, at all levels, and it's opened up the chance to do some teaching, which always makes my own writing better. Good teaching, I think, throws a question out there and all the knowledge and experience of the whole group can be teased out and shared, I always learn loads, anyway! I'm teaching two workshops on writing short stories at Barnstaple library, should be good. Is my book REALLY getting published? I'm in the middle of one the weird phases when I can't believe my book will get published. When I'm working on it, it seems real. Then it goes off to the publisher for its next round of polishing or editing or whatever mysterious transformations it undergoes, and it starts to seem unreal again. The book deal happened so long ago, October is a long way away. My new writing seems more real to me. So now the chapters and scenes are all being rearranged and they tie together better and flow better. I don't want to make it too complicated to read, but I don't want to dumb it down too much, either. Now, in the middle of what is going to be a very busy week, I just need time to sort it all out and that will provide me with springboards to jump back into the plot strands. In theory. On another subject, I've been offered an opportunity to attend an all day poetry workshop with Ruth O'Callaghan, a terrifying prospect as I haven't written more than a few lines of poetry since last year. Scary stuff, being the least experienced writer at a workshop! I'm hoping to do some teaching too, perhaps on Short Stories. It would be good for me to get my head back into the succinct forms of writing again rather than all this rambling novel stuff. I've realised something about writing. I can type up thousands of words a day, I suppose, if I really tried. But most of them would be scrapped because they were rubbish shortly afterwards. At the moment I'm writing 2000 words a day and they are scrappy, scruffy but mostly good. I've been planning this book in my head for about a year, and that takes way longer than just writing it. Looking at my notes, post-its, conversations I've had over the last year, I realise that's what really takes the time. The typing is another creative process, but once there's plot threads to hang it on - the warp as it were - the weft slides on fairly comfortably. I just need to ensure I have enough threads to weave a whole book with. I think I'm fairly sorted with the historical strand - my characters are on a journey and that's always interesting to write, if filled with very time consuming research. 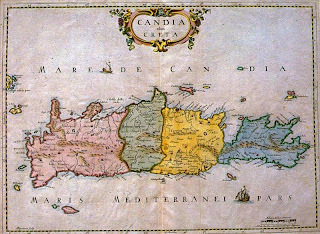 What was Brindisi like in 1587? What was Greece like under Ottoman rule? Crete, under Venetian? That's what takes up all the time, constant stopping to hit the Internet or my pile of research books (increasing almost daily). I think I take maybe a year to plan a book and about three months to write it, followed by months of intermittent editing. I also creeped myself out in the contemporary strand, enough to stop me writing in the evening and wait to finish the scene in the light of day. I would love to claim that's just how clever I am as a writer but sadly, I think it's more the case that I'm easily scared. I'm scared of the dark. I suppose my own fear ends up on the page, which makes it more vivid, but it's still frightening to type those scenes! I tend to look back at my journey when I hit milestones like the hundreds. I don't post every day, sometimes I post just once a week, and they are largely about how the writing is going. I'm beginning to repeat myself, in some cases several times, but I have noticed a change over the last few years and books. I'm more confident in what I'm doing. I'm better at recognising the good writing, less bothered about the scale of writing a book or editing one. I have more confidence in the fantasy side. I'm seeing writing in a more pragmatic way, rather than the process of exposing my skills/lack of to the world or even a single reader. I know that in four months, my book will be out there for people I have never met and probably never will to like or not like and there's nothing I can do about it. I know I'll have the odd day when I just want to apologise for the mistake on page 114 or whatever, but it will be out of my hands, book 2 will already be a done deal at the publisher's and book 3 will probably be finished as well. I've changed enormously and the process has been journalled in this blog. But I'm wondering where it goes next. Do I want a 'warts and all' blog documenting my fears and failings out there? I've also blogged about my mental health problems, my lost daughter, sister and husband, all deeply personal stuff and it's all mixed up with the writing stuff. I'm not sure if being exposed through my books might be enough and it might be time to pull the plug on the writing blog. After all, I did call it 'A Writer's Journey to Publication.' What do I do when I arrive? The thing is, years ago I was completely inspired by a number of bloggers who were further along that journey than I was. Candy Gourlay, for example, shared every step of the way. Sarah Salway's old blog was also constantly encouraging, as well as beautifully written (check out her new blog here). Dean Crawford too...and Cally Taylor, the list is actually way too long to put here. So, if my strange journey can help anyone else, I'm happy to tidy it up and continue but part of me thinks I need to focus on a 'proper' website/blog about the books. I don't know what to do. Any ideas? I've written ten thousand words since last Monday, one tenth of a book. I have no sense of whether it's actually paced to be the right words to be at this stage, I have no sense of the middle or when the ending will start. This is my biggest weakness. Ideally, I would have a bit of a plan. Maybe it's a bit too sat-around-drinking-tea, always a worrying development. I'm stretching myself in three time lines at the moment: 1578, 1612 (these are related) and the present day, which means if I'm stuck in one I can always got back and write one of the others. On the plus side, I've run off a few new copies of book 2 for my mother and brother and the kids to read, it's important to me to have feedback in the scary times while I'm waiting for official editing notes to arrive. It's reassuring to already know where the plot sags or doesn't quite work before I have to start work again. The sunny weather has been lovely, drawing us all out into the garden and into another project which we are doing for fun. My husband Russell and I are writing a musical for kids, just for fun. It's not the first one I've collaborated on, and it came out of a short story I wrote some years ago. We sat in the sun, surrounded by sparrow wars (we have two rival nests at opposite ends of our roof) and wrote two songs and worked out plotlines. One thing that's becoming obvious, this is a massive project that is only going to get a small amount of our time, and yet the energy of it seems to pervade every other area of our creative lives. This is what happens if you marry a writer and a musician, apparently. Russell (who used to volunteer for a theatre) has a lot more practical experience than me, and has come up with some great staging ideas. My favourite is having the kids hunkered down with their backs to the audience, so you can only see the backs of their T-shirts, decorated to look like tombstones. Then they turn around, and the front is decorated to look like skeletons, before launching into a quasi-gospel number. It's fun doing something together, him with his guitar finding the tunes and me, with my notebook scrabbling for words. We were out there so long we both got a bit sunburned. I've found my new ending for book 2 with a cliffhanger, and now it's led me straight onto a strong beginning with book 3. Hooray! It's lovely to be writing new stuff again, my favourite task. I'm still editing the middle of book 2, but writing new words is great, so I don't mind as much. It all still needs a read-out-loud editing pass, but I can do that over time. I love this bit, the new writing. I feel a bit possessed by the book, fragments keep intruding and I have to jot them down. I've had the historical strand developed for the whole time I've been writing book 2, so it's nice to finally be into the contemporary strand as well. When I look at a book I have to write, its ghostly presence, empty ahead, I can't imagine what will be in it. I even worry that I won't be able to come up with anything for it. It will just sit there, four hundred empty pages. Then an idea comes, usually when I can't work on it, and it's like a flame, it starts to catch, creeps up one page, then starts catching more pages until I'm compelled to write. I love the feeling but it's scary, because I get 10-15k into a new book and I stall, every time. I watched a documentary about Ian Rankin and was surprised to see he does the same (no other comparisons with Ian Rankin, sadly). It's a bit disconcerting, but I trust now that my story just needs to catch up with my typing when I get to that point. I was tallying up my completed or mostly-completed novels the other day and was surprised at how productive I have been, even through the head-banging-on-desk phases. There's the B&B book, the Georgian historical book, the stalker book, the one about the scary village, Marley and the Crow, books 1 and 2, A Baby's Bones... all in less than six years. OK, a lot of them were rubbish but I think they are the learning books, the pushing through that ten/fifteen thousand or page 65 barrier through to the middle and towards the ending. All the failed books are too short, none is over 70k. That's what I need to remind myself, they aren't really failed because they were the training ground for now when the books do just come. With a lot of sweat and tears along the way, maybe, but they do grow and into proper books. Now all I have to do is learn to love editing. Today was sunny - actually, North Devon has been sunny for a few days now. My mood has lifted, the garden has sprung into life and an ending for the book just leaped into my head while I was plodding through the edits. A real fireworks and cliffhanger style ending, complete with twists and turns. Why can't we just turn a mental knob and drop those out intentionally? Why do they leap into my head only when we're in the car or I'm in the bath or out shopping? It would be so convenient to have the 'eureka' moments when I need them! Not that I'm ungrateful, but I'd managed to get quite down waiting for idea lightning to strike. So, that's book 2. I'm so grateful it's chugging along and now all I have to do is work on all those silly mistakes and edits. The sunshine has inspired my gardening-phobic husband into the garden, not to slash and burn (the only garden task he normally tolerates) but to prune and hedge and strim and even help empty and fill planters. The garden is looking rather lovely, still jungly and overgrown but almost as if we planned it like that. Due to my very dodgy back I've put more vegetables in pots this year - I have a whole pot full of rocket to harvest, and we're doing well with spinach and lettuce for salads as well. Tomatoes and chillies are still waiting to be potted on - it was so cold I didn't want to stress them. Growing food, even if just a few leaves for a salad, cheers me up. The chickens are still laying, so we can have rhubarb and real custard, all from the garden. I feel the urge to sit in the garden and scribble in notebooks, but it's as if I'm a different writer with a pen in my hand. Illegible, for one. I type all the time and my handwriting has gone from poorly formed and scruffy to random scribbles. Maybe I do write poetry first drafts better with a pen...I'll never know, since I can't then type it up. Maybe I should practice writing more. I find handwriting often produces better work, more literary-style writing and definitely more descriptions and settings (one of my weak points). I wonder if we access different parts of our brains when we type? At this stage, my manuscript looks a bit like a book but actually is a pile of disparate scenes and chapters which more or less meander along in a narrative. To a disappointing ending, because book 2 ran on into book 3 and I couldn't work out how to separate them. Now I have a whiteboard full of snags to fix, and am reading through it finding the bits that are repetitive and bits that don't connect. Last week my agent and editor mentioned the same thing: the links between the two strands. It's disconnecting to move from a dramatic scene in the contemporary story to a scene in 1587 in Venice...unless they somehow tell the same story. So I'm linking the two strands up much more. The whiteboard would be even more helpful if I hadn't groped for the light switch the other day and erased some of the useful suggestions on it. Book promotion is still on my mind, mostly because the concept is terrifying. I've read a book about it (twice) and am waiting for contact from the publisher. I often reflect on the fact that in some ways I am unprepared for this journey. The Mslexia competition got me an agent, who got me a publisher... I wasn't expecting all that. I was just gearing up for a first round of submissions and rejections. I'm very grateful, I just wish the fast track came with a few more explanations! I've been informed by a number of writers that I should have been worrying about promotion months ago, and here I am, barely starting the process. Writing the books is so much easier, but if no-one knows about them, no-one buys them, and the publishers stop buying your books. But I know authors that are fantastic at publicity and promotion who have modest sales, and a few lucky recluses that do just as well with a very low key campaign. Confusing. More research needed I think. I have a few volunteers for a project I'm working on, more about that later. 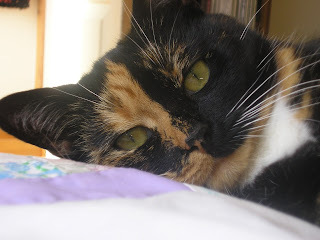 I'm still missing my moggie writing companion. His sister has taken to sitting on my lap all day, which makes typing impossible...not the same. Now here's a subject I know even less about than usual! How does a writer promote their own book? There are those writers that just go around gushing: 'It's brilliant, the best thing I ever wrote!' They tweet, and blog and message you, and I find it puts me off reading their masterpiece. Then there are the others who pretend the book isn't even theirs. 'Oh, that old thing?' *blush*. I have a horrible feeling I fall into the second camp. I get embarrassed just trying to describe the books, let alone when people praise them. It's not that I don't think it's a good book, I do, and I know it's well written or it wouldn't have done well in the Mslexia competition. It's just, books are very personal, I can't promise someone would enjoy any book, even my favourites. So I'm looking into ways to promote my book that don't involve me having to beg people to buy it while proclaiming it brilliant. There are a small number of very kind people who have offered to help big up the book and I think I'm going to ask them to help. I think I need a team of people who can help rather than just me. So, if you think you might like to help, could you drop me an email with your email address and I'll get back to you. I will reciprocate, of course. And if you have any ideas, please make suggestions! I'm at a loose end here. I've been invited to give a few talks and I have a book launch/signing organised on the Island but that's as far as I've got. I have bought a book on promoting novels, too, and Liesel Schwarz has been encouraging and is going through the same process and I'm following her advice, too. I set off for London to see my agent, Charlotte Robertson of Aitken Alexander Associates, with some trepidation. Writing books is something you do essentially alone, chained to a keyboard somewhere, it's not as if you have weekly progress meetings or anything. So you can get seventy, eighty, ninety thousand words into a book and have no idea if it's working or not. My first drafts are just a heap of chapters and scenes in no particular sequence, even though I do try to write in order. So, months after I start I have reordered, rewritten and hopefully improved the thing into an actual novel, then something happens. I start to like it. Not the whole, but bits of it. I start to pat myself, entirely secretly, on the back for the chase through the forest or the scene at the hotel. Then I have to show it to someone. Charlotte is my show-it-to person. She is quite matter of fact with things that don't work, and enthusiastic about things that do. I have come back fired up with ideas to work n those areas of the book that don't excite and enthuse either of us. More than that, I showed her the plans for book 3 and a crime novel I'm rewriting for fun. (My hobby is writing as well as work!). Book 3, yes, green light. And my quirky crime novel where no-one is actually murdered, yes, give it a go! But what I really needed was reassurance ahead of publication that I could write, my books work and my instincts are good. It's heady stuff, all that positive feedback, and I shall keep it in the back of my mind for dark days when the words stutter. I also met my editor, Michael Rowley and his assistant Emily Yau, from Del Rey UK. We joined two other Del Rey authors (Liesel Schwarz and E J Swift) that I've met on line, and we had a great evening. A whole evening full of people who are passionate about writing and story and books. It turned out we are also captivated by our cats, which helped with the I've-just-put-my-cat-down blues. Publication still seems a distant fantasy, but less so, hearing these writers describe their journey. I was inspired by them, as I have already been by their books.